Wayne Goss has added new brush sets to his collection in a 6-piece Face Set ($250) and 5-piece Eye Set ($130). The Face Set actually launched in earlier this year back in March and sold out within a few weeks. It’s scheduled to restock today at Beautylish at 10 AM PST/1 PM EST. In addition to the set, they’ll have each brush available for purchase separately. The Eye Set is still available as a set for now. I’m hoping they’ll consider launching them individually. By now I’ve accumulated quite a few brushes from dozens of brands. I’ve found only a small handful of new launches different or unique enough to have that wow factor. The latest launch that really impressed me was the MAC 140S (best powder brush ever) but when it comes to brushes I feel like I’ve already found my favorites and I buy multiples of a few so I don’t have to wash them as often (especially when I have an armful of swatching that I do). Wayne Goss brushes however are completely different and I’ve been so impressed with every one I’ve tried from his line. If I had to start over my entire brush collection I would pick his brushes to do it. At first glance they seem like they could be standard brushes just with a well-designed size handle and shape. Once you put them on your face you will really see the difference in how soft and smooth they are. You’ll also notice that they pick up product better and application is SO MUCH better. For years I’ve loved and relied on MAC brushes, in particular the #217, 219 and 239 for the eyes. They’re classic staples and perform well, but once you’ve tried brushes from Wayne Goss, Hakuhodo or Chikuhodo you’ll be floored. The brushes are handmade in Japan and are cruelty-free. A look at each set and a few comparisons for size/shape reference. I was sent these for review by the Beautylish team but I would have no hesitation splurging the full retail price on both sets. Up first is The Face Set which has 6 brushes. From the bottom to top, these are designed for both powder and creams. I took a few of these with me on recent trips along with other brushes and these were ones I reached for the most. They’re unbelievably soft and layer product beautifully without disturbing what’s underneath. There are certain uses for each one, but I used each of these for almost anything: powder, blush, creams, highlight, etc. Up next is The Eye Set. Out of the 5 brushes I thought I’d only really use 2 based on the shape. I gave them all a test run and found them surprisingly versatile. A look at how I tested each one with the Natasha Denona Sculpt and Glow Palette (review soon), Tom Ford Warm Soleil Eye and Cheek Palette (review here) and one of my favorite setting powders the Charlotte Tilbury Air Brush Flawless Powder (shade #2). The brushes were all versatile with powder and cream formulas. With powders they worked well with all textures whether they were shimmer, matte or glitters. With creams they apply product without any streaks which is just amazing. To date only Tom Ford brushes have done that for me and the Wayne Goss brushes are similar in performance and quality. Bottom line amazing. Many of you might wonder if I think they’re worth owning even with all the brushes I already have. The answer is hands down yes. I’ve been one who always stuck with MAC because I found good ones that worked and they still do, but the Wayne Goss brushes take application to another level. Based on my personal preferences I would skip the fan brush #15 (because I don’t use fan brushes ) and the eye brush #19 (because it’s similar to #20). The brushes perform so much better than other standard brushes. If you already own a lot of brushes made in Japan you probably have some of the best ones on the market. I don’t own a lot with the exception of a few so I don’t have a lot of repeats. 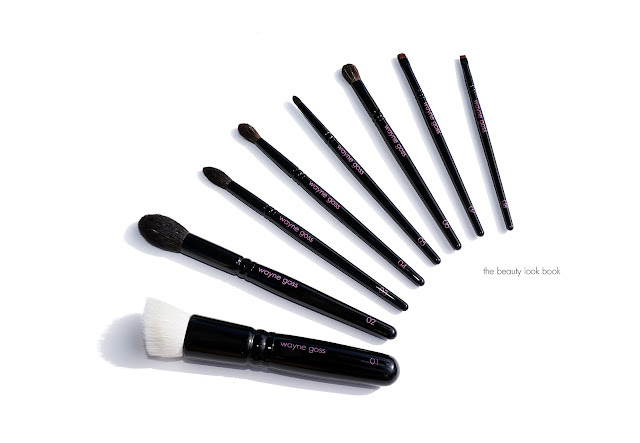 You can find the Wayne Goss brushes available online at Beautylish. The Eye Set is in stock now, the Face Set (and individual ones) restock today at 10:00 AM PST. Have you tried these? What are your thoughts? If not what are your go-to makeup tools? Many thanks to Beautylish for sending The Face Set and The Eye Set for review.